Drip marketing... more like making waves! The usefulness of drip marketing is well documented, but by itself is not sufficient. Buyers don’t buy until they trust. Trust can only be built with quality interaction – human interaction. Selling success is due to far more than technique - it’s the design and implementation of a process that proactively and rhythmically communicates your value propositions to strategic targets while building trusting relationships that enable you to learn about buying systems and a prospect’s motivation to buy. For decades, sales trainers and texts have taught the techniques of the sales trade. Opened and closed end questions; trial, soft and hard closes. However useful these techniques appear on the surface, they rarely produce the business growth results we expect. It takes more than technique. Remember fax blasts, catalogue sales, direct mail, telemarketing, email blasts – each in its time was thought to be the answer to business growth. We now know that, by themselves, none of these tactics produce meaningful, sustainable business growth results, but combined, managed and measured, success becomes more predictable. Timing is the most critical variable in business-to-business sales. We’ve all been there, “I like what your company can do for us, but you’re three months late.” Or, “This sounds great, but I won’t be looking at this until next year.” Of course, if we knew exactly when various buying influences were going to buy, we’d make contact appropriately – the challenge is that we rarely know the timing. So what do you do? Your sales systems, incentives and supply side work make it hard for you to build relationships with organizations that are not sending you money. 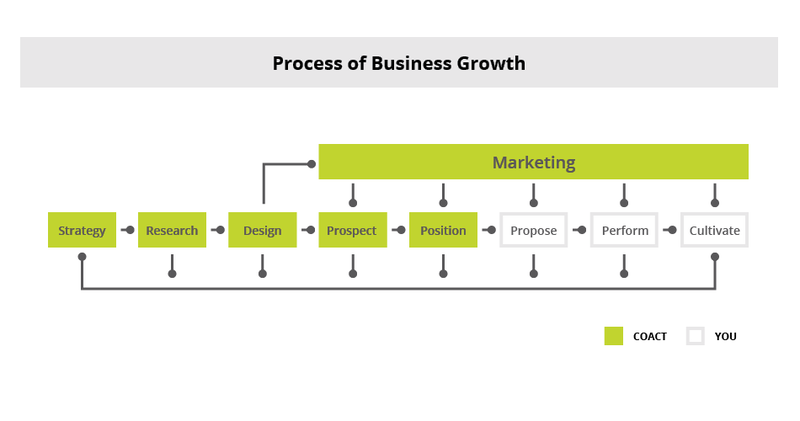 Business Growth Has A Lot More To Do with Process Than It Does Technique. Sorry, there was an error processing your request. Please try again later. Sales Synergy is about collaboration. 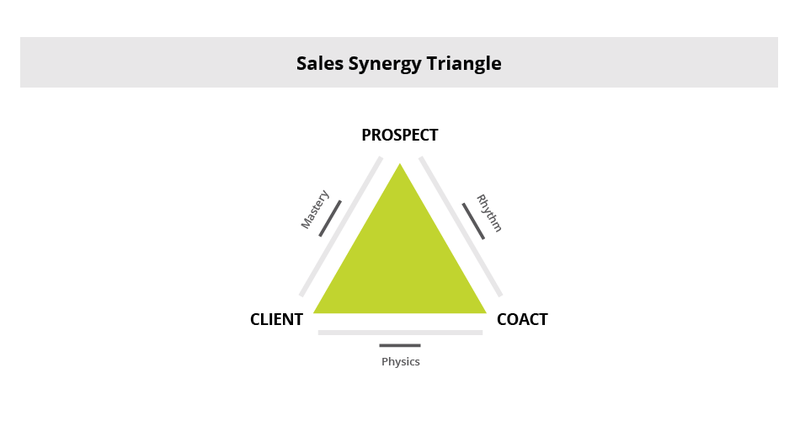 Sales Synergy is our system for understanding your company, your market and the unique value you provide to customers. It all begins with Physics – our team becomes oriented to your organizational history, culture, customer success stories and products and services. We help you to strategically define your business model, focus your go-to market strategy, choose your future customers and sharpen your message. These are essential building blocks to business growth success. Our Physics process is specifically designed to build a plan to grow your business. COACT works closely with you and your team to design the business growth elements that will be critical to success. Physics features elements of strategic thinking, brand messaging, target research and list development, and the development of selling propositions that will resonate in the market, differentiating your organization in a competitive market. How do you supply it? Why do the buy it from you? Using the best tools available and applying our deep expertise in market research and target list design, our people build knowledge about your market and work with you to build a high-value target list. We believe that meaningful business growth begins by strategically selecting your future customers, rather than having you hope and wait to be found. How do your people build enough knowledge to sell our products or services? As you might imagine, this is a common question. Every market-facing employee of COACT has earned at a minimum a bachelor’s degree, with more than a fourth of them holding master’s degrees. But, degrees are not enough – we have designed an orientation process that compresses the knowledge needed into a manageable timeframe to represent you in the market and we prove it… before we begin any market interaction your COACT selling team will present your company to you, including their plan for growing your business. Let COACT help you improve your sales process by increasing connections to strategic and qualified prospects by efficiently using our sales and marketing resources. Next we install a Rhythm of communication and learning. Targeting your ideal customer profile, we apply various "touches" including direct mail, email, online marketing and telesales, to build awareness and learn interest, eliminating the variable of timing. We learn about your prospects' buying systems and their motivation to buy. We do the heavy lifting - prospecting, pre-qualifying and positioning new business opportunities for your professional sales team to close. The primary objective of the demand generation process is to build trusting relationships between buyers and sellers. To build those relationships the parties need to interact; in fact, they need to have quality interaction. COACT designs a series of touch points creating a Market Rhythm that removes the variable of timing by installing waves of communication and learning – built around your value propositions. The most critical variable in business-to-business sales is timing. Too late is frustrating and too early is an enormous challenge. Most business systems are not designed to make friends with those organizations that are not sending them money. COACT eliminates the variable of timing in your sales process. Most business growth efforts fail or struggle to meet expectations. Why is this? Most rely too heavily or exclusively on one tactic alone - direct mail, email marketing, search engine optimization or telemarketing. An integrated, consistent, proactive series of direct mail, online marketing and telesales touch points, combined with handwritten thank you cards, come together to form waves of communication and learning. These all work together to position new business opportunities for you to close. All this is put in place to help your organization build Mastery in the market. Over time, the information we gather becomes knowledge. That market knowledge is analyzed and shared with your team, allowing them to customize solutions that change rules in the market. One of our goals is to supply your organization with a meaningful, sustainable competitive advantage, making you the competitor of choice. Now it’s time to do what you hired us to do… sell. COACT determines a prospect's motivation, learns the prospects buying decision process, and profiles the prospect’s buying habits – helping you customize a winning solution. Client mastery is developed and delivered as we gather, organize, analyze, and transfer knowledge to your team. This knowledge transfer helps you create a mastery in the market that clearly differentiates your organization from the competition. Contact COACT today… and let’s work together to grow your business. Are you dedicated to business growth? This is not a trick question; the answer is more complex than you might originally think. Imagine the business growth system on a zero-to-ten sales continuum, where ten is making money. 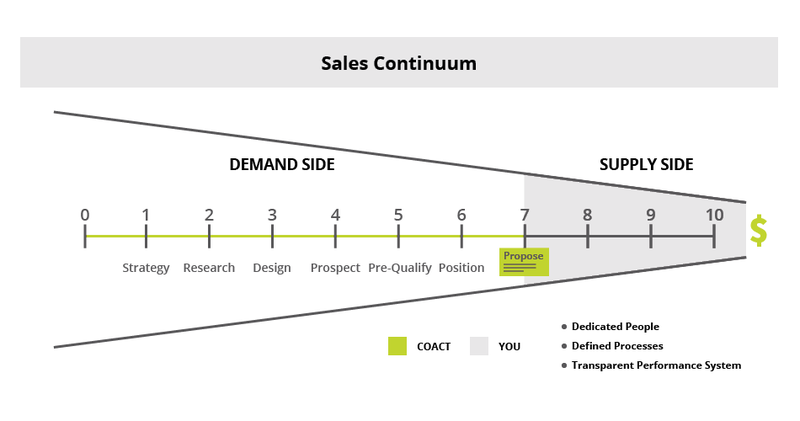 On that continuum, about seven is where you offer a proposal for your services or products. A successful proposal leads to an award, performing the work and taking payment… ten! At COACT, we call this seven-to-ten side of the business, the Supply Side. On the Supply Side, you have made major investments – rightly so. This is where you service and manage your customer relationships and improve the value you deliver. Your people, highly refined processes and a performance system are dedicated and featured on the Supply Side. There are organizational charts, job descriptions, process flow charts, dash boards and spreadsheets to communicate and monitor progress and results. We know that we need to strategically identify and increase demand to build a prosperous business system; however, as we reflect on our business model, we rarely find the same attention to detail and dedicated resources assigned to the zero-to-six activities on the sales continuum – the Demand Side. We understand economic structures and help our clients navigate important decisions about strategic targeting and industry segmentation. We use our experience and the best research tools available to determine high-value targets in complex buying systems. Standardizing an organization’s brand and image is a crucial aspect to any business growth effort, helping it stand-out amongst the competition. COACT has the experience and tools to provide our clients with a consistent, stylistically memorable brand image across all online and printed materials. In the end, people buy from people. Our team of inside sales professionals understand sales theory, but more importantly they have been trained on the nuances of relationship development and management. We navigate and build profiles of complex buying systems, identifying decision makers and building awareness about our clients’ products and services. We prospect, pre-qualify, and position new business opportunities for our clients to close. Whether you’re an event destination, trying to attract an event or exhibiting, COACT can help. Our process solution is built to attract and promote events, members, and participants. Our goal is to drive up membership or attendance, improve sponsorship participation and optimize advertising revenue. With an ever-changing internet landscape, it is useful, but not sufficient to have a nice website. Today, website design must reach for a higher level; a level that aligns your website to a more overarching internet strategy to “be found” and speaks to various visitors in a meaningful way with elegant design and interaction elements in place. We provide our clients strategic guidance, professional design and back end support to better attract high-value targets. We analyze results, make recommendations and adjustments to improve traffic and ease of use. The world of online marketing can be quite overwhelming, and it is easy to get lost in the noise. Our team of experienced online marketers can provide you with the strategy and guidance to stay the course. Every marketing element put in place is meaningfully done to promote your value in the decision makers’ mind. We know how to get high-value targets to engage with your brand and we monitor that level of engagement at every interaction. COACT understands the necessity to make sure that our clients have the right message and are projecting a quality image to the desired audiences. We provide the expertise and tools that competitively differentiate our clients in the market. We design and manage social media and PR messaging to assure that our clients are seen as active and reliable sources of quality industry information. With an ever-expanding need for an inbound marketing presence across multiple platforms, organizations are challenged to find what message to provide, and what avenues they should use to distribute that message. Our team of professionals create the content and message to give our clients the credibility they need to be discovered and thought of as experts in their field. Sometimes marginalized as “old school” thinking, direct mail is a very useful awareness tool as a compliment to inside sales and online marketing. We design and administer efficient and effective direct mail elements that drive high-value targets to websites or various offers. Many targets trust direct mail more than online marketing; therefore, offering another access point for the decision maker to learn about our clients’ value propositions. The arrival of visual imagery and streaming media is obvious. Professional video production of everything from manufacturing process to customer advocacy, people profiles, video newsletters, and messages of expertise and demonstration bring lift to any awareness and learning campaign. Augmenting our current relationship management, lead generation, and marketing services, CAP means to help identify customer advocates for our clients and engage those advocates in meaningful ways. Customer engagement can take on many forms including various types of endorsements, but ultimately, it is intended to have our client and her customers jointly improve each other's business performance.